For western visitors, Thailand can be a wonderful and enlightening place to visit, with its cultural and artistic treasures providing a wonderful treat for the eyes and mind. This is particularly true of Koh Samui, which epitomises the sort of culture and colour that can almost overwhelm the senses, yet also provide a deep insight into Thai life and religion, both now and down the ages. For those keen to explore this aspect of the country, the highlight of a trip to Koh Samui will be the Wat Plai Laem, a large Buddhist temple compound on the north-east coast of Samui. The temple is an active one and while visitors may admire its immensely colourful and decorative appearance, respect is also called for, particularly as it remains a major centre of religious activity today. Indeed, the temple is fairly new, even if the practices that go on there are rooted in Thai Buddhist tradition. Its incredibly colourful interior is mainly the work of Thai artist Jarit Phumdonming. Other features of the temple are a laughing white Buddha statue, with this image being one that is mandatory for every temple. Other elements required for temple status include a relic from the teacher himself and a willow tree. The temple is also surrounded by an artificial lake, which is filled with fish. Indeed, those making a donation to the temple are given a bag of food to feed to the scaly inhabitants of the water. 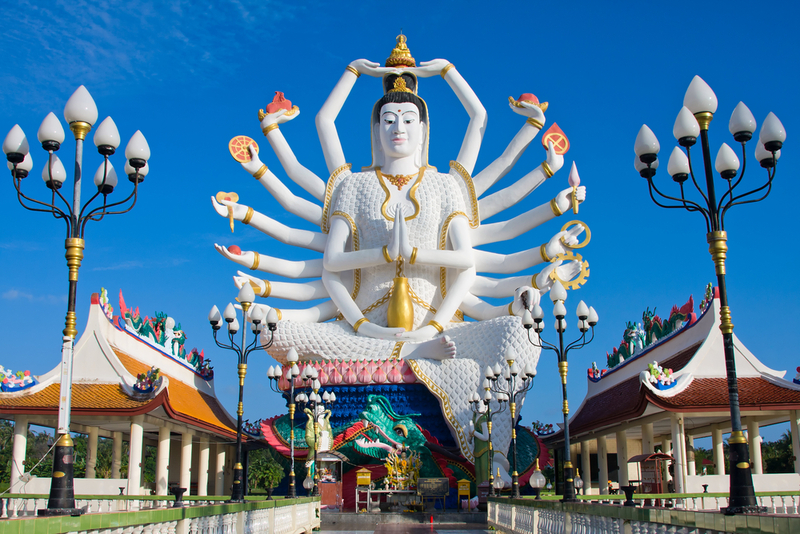 However, it is not just Buddhism – a non-theistic faith – that is represented at Wat Plai Laem, as just outside the temple is a statue of Guanyin, the goddess of mercy and compassion in traditional Chinese-Thai religion. Remarkably, she has no less than 18 arms. Either side of the statue are frescoes depicting images from Buddhist mythology. Visitors do not have to pay to go into the temple, but it is important to dress appropriately. Shoulders should be covered and long trousers worn, so this is not an activity to combine with an afternoon on the beach in a swimsuit. For all who visit this remarkable attraction, however, there can be no doubt the colours will be spellbinding and an understanding of Thai faith and tradition greatly deepened.